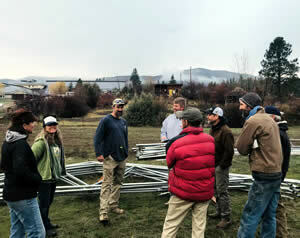 New Greenhouse for Classroom in Bloom with help from Winthrop-Kiwanis Club :: Methow Valley Schools • Every Student Shines! Operating with the mindset of “build it and they will come, better yet have access to enriching, outdoor learning opportunities and healthy, nutritious meals cultivated by their own hands,” Classroom in Bloom (CiB) staff, board members, and members of the Winthrop-Kiwanis Club gathered together early this morning to launch the construction of the new greenhouse! The 72′ x 24′ greenhouse will expand the growing season, learning opportunities, and food production used in MVSD’s meal services. For those who are not yet familiar with Classroom in Bloom, they are a non-profit organization established to enrich education through school gardening for K-12 students in the Methow Valley School District of Okanogan County, WA. The centerpiece of their effort is a 1-acre student-led garden, soon to include a new greenhouse. Through the garden CiB creates experiential, inquiry-based learning opportunities and teach ecosystem complexity and science education. They cultivate an understanding of sustainable food systems and foster a love of fresh and healthful foods. They believe that children love to eat the food they grow, and they make this a reality for our students. As part of the curriculum, students help build soil, turn compost, save and sow seeds, pull weeds, prune trees, clean tools, harvest food and weigh and deliver fresh produce for our Farm to Cafeteria program. Please join us as we thank Classroom in Bloom staff, their board of directors, Winthrop-Kiwanis, Public School Funding Alliance, Community Foundation of North Central Washington, MVSD Food Services Team, and the many donors throughout our community who make enriching learning experiences and access to healthy, nutritious, tasty meals for all students possible!